for your baby & YOU !!! The Lullabub will gently create motion automatically in a harmonic rhythm to naturally soothe and settle babies to sleep. 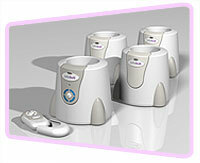 The “Lullabub” consists of four décor designed modules, which are simply placed under each leg of a cot. The “Lullabub” is an innovative product that will gently rock a cot automatically & unassisted, in a harmonic rhythm to naturally soothe & settle babies to sleep. Helping the parent attend to other duties or catch up on some much needed and well deserved REST. 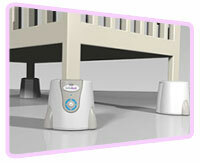 Simply fits under each leg of your new or existing cot. Overall, a happier baby & a happier YOU!!! Please also check the “cot leg size” file attached above and check the weight of your cot/crib Before you order. If you have any concerns please email us. Click here for correct procedure for installation. • Only use in conjunction with a cot or crib. NOT to be used with a child’s or adult bed. • The Lullabub is NOT a toy, an adult is to operate the Lullabub at all times. 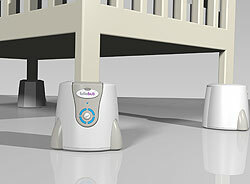 • The Lullabub is an assistance product and is NOT a babysitter. Adult supervision is still required, at all times. • Only use the Lullabub with a cot or crib which the measurements of the leg’s are similar to 90mm x 45mm or any combination of measurements lower than these will fit in the Lullabub unit. If in doubt with any concerns please ring or email your supplier and ask. • All parts contained within Lullabub are RoHS compliant ensuring Lullabub is suitable for sale worldwide. • Lullabub is safe to use around siblings and other young children. 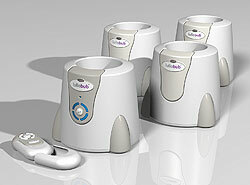 • Lullabub is a low voltage device operating with a six volt power supply. • All electronics contained within the Lullabub are protected from being accessed by children who may be outside the cot. • Lullabub prevents a cot from being rocked in excess of five degrees which is half of the maximum ten degrees allowable by the Australian Standards. Sleep for your Baby & Sleep for YOU!! !